CollageIt Pro for Mac from PearlMountain Technology is an easy-to-use but efficient Photo Collage Maker. 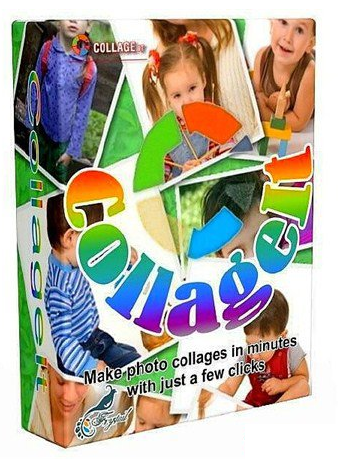 It supports 4 collage styles and 30+ collage templates with which you can high quality photographic collage with upto 200 images. Powered with real-time preview, CollageIt for Mac allows you loads of customizations. You can change page size, collage background, adjust photo count, photo space, page margin, rotation & sparse, add photo border & shadow etc. The collage can be saved as JPEG, PNG, PDF, PSD image and can be printed out of emailed via the program. CollageIt for Mac has both free and pro versions. Differences from free are large size collage export, photo cropping, lifetime support etc. CollageIt for Mac has a easy to understand user interface which makes it easier to use. CollageIt for Mac can create collage quickly with proper resource optimization. You can use up to 200 pictures to create photo collage. This way you can keep quite a large amount of memories in on place. Each image can be cropped to select only the meaningful portion. You may add photo border and shadow added for decoration. It offers diverse types of photo collage layouts that can be generated by using the Random Layout function. You can manage each layouts by adjusting the parameters like photo count, photo space, page margin, rotation and sparse. More than 30 collage templates are availabel with this software with which you can turn even an ordinary set of images into an impressive one. 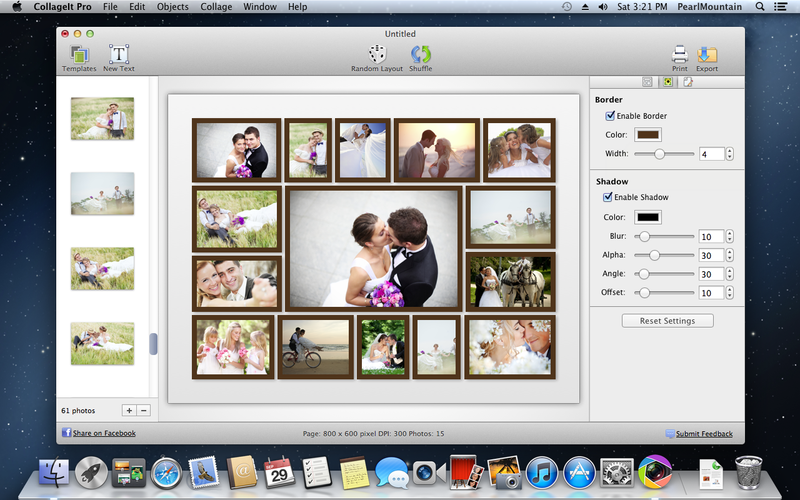 CollageIt for Mac offers 4 collage styles including Mosaic, Grid, Center and Pile to make your favorite photo collage. You can adjust the collage size as A4, A3, 1024×764 pixel and even of custom sizes. The collage background can be chosen from a large number of available images. You can export the photo collage as JPEG, PNG, PDF, PSD picture formats. You can even take a printout of the photo collage, set it as Desktop Background, Email it to your friends or family members directly using the software GUI. CollageIt Pro for Mac costs $29.90. Thanks to Candy from PearlMountain Technology, I can giveaway 10 licenses of CollageIt Pro for Mac. Sounds interesting? Just leave a comment saying a few relevant words and I will enter your name in the contestant list. If you are an Windows user, you can also ask for licenses, but please mention in the comment that you are asking for Windows license. Otherwise you will be counted for Macintosh license draw. This giveaway will be expired in the midnight of 12th Feb, 2013. I will announce the winners at a later date. Winners will be chosen randomly from the contestants list. I love honest people. So, don’t use tricks to add multiple entry. I am smart enough to find you out.!! 1. You love this contest? Please share about this contest with your real life and social media friends. They will love this too. Use share buttons to share about this contest in your social networking account. 2. I will also appreciate if you follow me in my social networking account. That way we will get connected and updated. Find the sidebar widget to connect with me!! 3. Trust is everything!! I would be delighted if you could rate my sites Insights in Technology on Web of Trust (WOT), Norton Safe Web, Webutation, McAfee Site Advisor, Alexa or any similar service. This entry was posted in Free Offers, Giveaway, Graphics Management and tagged Photo Collage Maker. I have used the PC version and like it. Owning a license for my Mac would be perfect. Thanks for the giveaway. Dear Sujay, Thank you for the review and for this opportunity to enhance my Mac software library. Thank you so much for the giveaway and I want a Windows license. Collageit is nice software specially this Valentines for your perfect memory. Great program! Great giveaway! Count me in!